The carrot (Daucus carota subsp. sativus) is a tasty root vegetable that is good for you because it contains fiber, vitamins, and other healthy plant nutrients. Eating carrots raw, blanched, or in a nutritious meal can benefit your health in general. In fact, research has shown that carrots are good for your eyesight, heart, skin, and may even help you lose weight. Drinking carrot juice can also benefit your health because it contains a large amount of vitamin A, C, and some B-group vitamins. Because carrots are a good source of antioxidants, a glass of carrot juice can give you a concentrated amount of healthy nutrients. 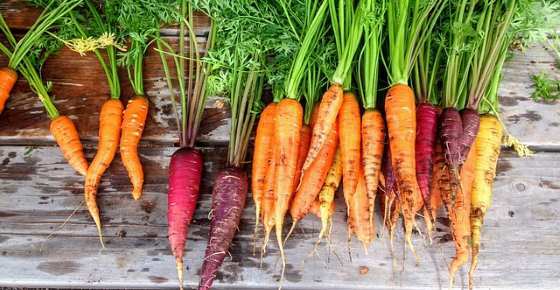 Although we tend to think of carrots as an orange vegetable, carrots come in various colors such as purple, red, yellow, and white. In this article, you will learn about the many reasons why eating carrots every day can be good for you. You will also find out if there is such a thing as consuming too many carrots. At the end of the article, you will find out how cooking affects the nutrient content of carrots. The carrot is a highly nutritious vegetable that is loaded with fiber and antioxidants. The nutritional value of a carrot is fairly impressive, especially as carrots contain very little fat. Let’s look in more detail at the main nutrients you get from eating a carrot. The other carbohydrates in a medium carrot are sugars (2.9 g) and starch (0.9 g). The weight of carrots is mostly water which accounts for nearly 90% of their weight. As already mentioned, carrots are good for you because they contain a lot of dietary fiber (1.7 grams of fiber in one medium carrot). A cup of chopped raw carrots (128 g) contains 3.6 grams of fiber. This is about 14% of your recommended daily needs (RDI). Although carrots are a sweet vegetable and contain sucrose, glucose, and fructose, their fiber content means their sugars are released slowly in your body. So, carrots can be eaten by diabetics and are a great healthy snack if you are trying to lose weight. Eating a raw carrot will give you a massive 10,190 IU of vitamin A which is double your RDI. Carrots also contain good amounts of vitamin C, K, and B-group vitamins. There is also some vitamin E in carrots. Carrots have many other nutrients that are good for you. Carrots also contain important minerals such as potassium, magnesium, calcium, manganese, and phosphorus. Let’s look in more detail at why carrots are good for you and why drinking carrot juice is good for your health. The fact that orange, purple, and red carrots are packed with antioxidants means that they may reduce your risk of developing cancer. Learn more about cancer-fighting foods such as carrots that you can consume as part of an anti-cancer diet. Vitamin A is essential for good vision, and so it is no surprise that carrots are good for your eye health. Carrots contain many of the necessary nutrients to help protect your eyesight. Learn about other foods you can consume to help improve your vision. Find out how to get some of the healthy benefits from carrot juice by making your own vision-boosting juice. Eating a portion of carrots daily can be good to help improve your cardiovascular health and lower your risk of heart disease. Find out how you can help to protect your heart from disease by including heart-healthy foods such as carrots in your diet. Carrots are a delicious crunchy snack that can help soothe hunger pangs if you are trying to lose weight. For example, one cup of carrot strips (122 g) only contains 50 calories. This serving of raw carrot also gives you 14% of your daily fiber needs (3.4 g). This means that carrots are a low-calorie, fiber-rich food that helps keep you feeling fuller for longer. Further reading: Proven Ways to Lose Lower Belly Fat Based on Science. Even though they are a sweet vegetable, carrots are still good to eat if you have diabetes. Carrots are a low-glycemic, non-starchy vegetable which means that they don’t spike blood glucose levels. A medium carrot only has 4 grams of net carbs and so is a good vegetable to eat if you are diabetic. It is good to remember that carrot juice may not be suitable if you have diabetes. It can take about 4 or 5 carrots to make a glass of carrot juice. This could contain about 15 grams of sugar but without the fiber that helps to slow down sugar metabolism in the body. If you have type 2 diabetes, learn about other scientifically proven foods to control blood sugar levels. Adding a few carrots to your daily diet can also give your immunity a boost. Learn about more foods that have immune-boosting potential and can help to prevent getting infections. Eating raw carrots or consuming carrot juice can benefit your skin because of the high vitamin A content. Although some foods are best eaten raw to maximize the most nutritional benefits, carrots can actually benefit from a gentle cooking or steaming. The researchers found that antioxidant levels increased immediately after heat by more than 34% and continued to increase for the first week of storage. After that the antioxidant levels declined, but didn’t go back down to the original levels for raw carrots. The research also found that adding the carrot peels increased antioxidant activity. Although carrots are very good for your health and form part of a nutritious, well-balanced diet, eating excessive amounts of carrots is not good. It’s good to remember that just one medium-size carrot contains more than enough of your daily vitamin A needs.